Various new TESDA courses are offered with limited but efficient durations per sessions, depending on which course, one may have chosen. One of the newest courses offered by TESDA is Photography. Since time immemorial, Photography was considered just a hobby to some, but for others, they have considered it as their passion, thus, crafted a vocational course out of it. 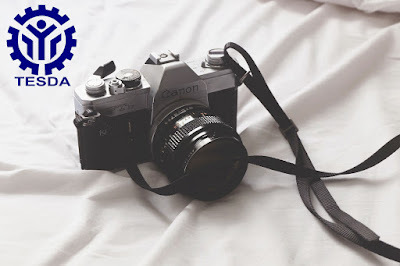 Now-a-days, applicants must have a Photography NC II certificate in order for them to be easily hired; this is in accordance to some employers. This training will serve as a guideline towards professionalism in terms of photography and having knowledge about it will help you raise your chances to being hired. This course will help you obtain knowledge in terms of camera operations, camera parts and equipment, basic knowledge in troubleshooting camera problems, and etc. so basically, this will help you enhance your technical skills, specifically, photographic skills. In this course, you will learn more techniques and possible photo shooting strategy and style, experimenting different angles and correcting faulty photography. This will be a pleasant training in eradicating curiosity towards camera difficulties; developing basic steps in setting up camera; and supplement ideas on how to properly shoot within the range of your camera settings. There are 50 different types of photography that you may discover along the way, techniques you may learn, proper selection of angles and lighting procedure. 3 of the 50 types of photography that you may want to choose are: Fashion photography; Beauty photography; and Nature photography. You may also be familiar with Wedding photography; Wildlife photography; Portrait photography; Advertising photography; etc. Self-employed photographers had the same benefits as any freelance professional. They could set their own hours and choose to work on assignments that either appealed to their artistic sense, paid more money, or both. Those working for corporations had the same benefits as any employee of that corporation. For example, full-time photojournalists at "The New York Times" receive insurance coverage for medical, dental, vision, hearing, disability and life. They can supplement their medical payments with flexible spending accounts that collected pre-tax dollars. They also receive paid vacation, sick leave, personal days and holidays. The work of a photographer -- if it's truly good -- can lead to wide exposure if photos are published in local, regional, national or international publications and other media. The potential for exposure both local and foreign ties into all of the other benefits, a photographer can reap. Freedom; more work opportunities and new relationships. Not to mention, the pride that comes from knowing that others appreciate your art. Exposure, that is. Photographers often collaborate with other artists, including makeup specialists, hair stylists, photographers, prop stylists, set designers and wardrobe experts. Some get to work with beautiful models. Regardless of who or what they shoot, photographers have the opportunity to network with other creative professionals on a regular basis. Through this network, photographers hear about work opportunities, forge professional and personal relationships, and gain photography-related skills. Photographers express how theyu feel or see life in the form of pictures. Their work can create awareness and understanding by evoking reactions and emotions in others. For example, columnist Maurice Berger, in the Lens section of "The New York Times," explained how photographer Gordon Parks used his images to help viewers understand and share the feelings of people from different racial backgrounds, in the hope of changing societal viewpoints. By expressing themselves creatively through images, photographers get to impact others. Photography NC II takes 234 hours to accomplish. This course will only last for 4 months. Some Training Institution have different set of requirements, you may contact them personally to know more information. There will be a lot of job opportunities that will open up as soon as you finish this course: Wedding photography, Event photography, Photo editing, Graduation photography, and even work as freelance. In addition, the title of being a “Professional Photographer” will be yours for the taking. Trainees who undergo in the field of Photography NC II need to take an examination before working independently. This is to assure that one is ready to take another step towards professionalism in his/her chosen field. Visit the nearest TESDA Training Center in your area and ask if this course is available in your area. Good day TESDA! Can you provide us the accredited schools where we can enroll ourselves? Appreciated your soonest reply. Thanks! What are the accredited schools in pampanga for photography? is there in davao city offering for this ? where is the tesda in CDO? Where are the accredited schools for NCII Photography? Please let us know. Hello po! Can you provide us the accredited schools offering this course especially in Davao City? Thank you! Sa naga city po meron? Meron ba nyan sa lahat ng Tesda Region? Meron po ba sa Iloilo? I’m very much interested. offer na po ba ang course na to sa Cebu po? Hi! Will this be available in Cebu? after scrolling the comments box. I think it is more beneficial to all of us if Tesda Main will post the list of places/ cities of your accredited center that offerred photoghrapy course. La Sallian Educational Innovators Foundation ( La Salle University- College of St. Benilde) Inc.
La Verdad Christian College, Inc.
hello po.. mai Cebu po ba neto? Meron po ba sa quezon city?